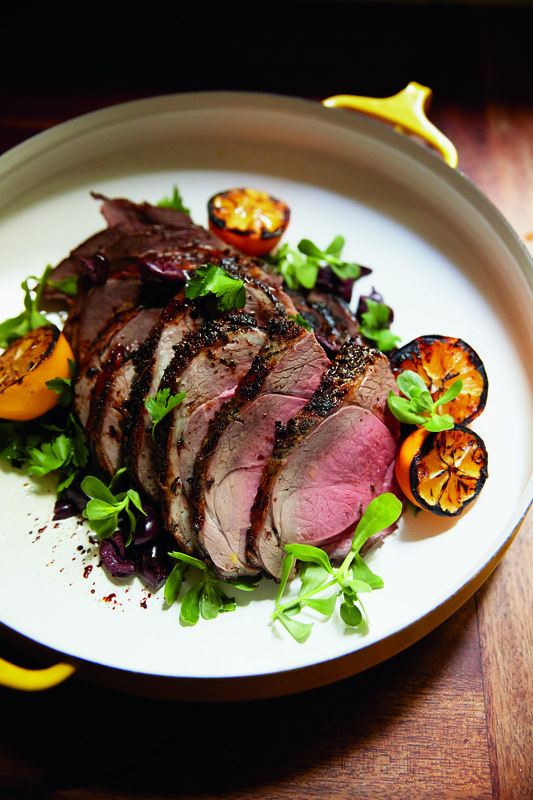 We’re always looking for delicious meat dishes that can feed a crowd with minimal effort, and this lamb is exactly that. Roasted whole and carved just before mealtime, it’s special enough for occasions and accessible enough for a weeknight meal. Remove the lamb from the fridge to rest at room temperature for 30 minutes. On a preheated grill (or grill pan over medium heat with a light drizzle of olive oil), char the lemons, cut sides down, until lightly charred, about 5 minutes. Reserve. Preheat the oven to 375°F. In a food processor pulse the fennel seeds to pulverize, then add the garlic, parsley, and olive oil. Pulse to make a loose paste. Smear the paste all over the lamb, and sprinkle on the oregano leaves. lamb from the oven and let it rest for 30 minutes. Slice, transfer to a platter, garnish with olives, purslane, and grilled lemons, and serve.